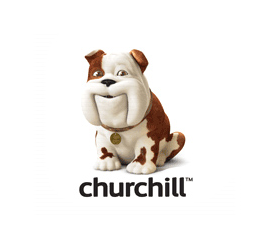 Churchill was founded in 1990 primarily as a car and home insurer, and over the years has expanded to offer travel insurance, pet insurance, breakdown cover and van insurance. They are a completely UK based and offer policies online and via phone. In 2003, Churchill was acquired by the Royal Bank of Scotland Group, making the bank’s insurance arm the second largest general insurer in the UK at the time. Since then following the bail-out of RBS by the UK government in 2008, the EU demanded that certain Group assets be sold off, including the company’s insurance division. Churchill became part of the new Direct Line Group in early 2012, which was created ahead of a divestment which was completed in 2014. The Churchill bulldog mascot is also one of the most recognisable in the UK from thier TV adverts after being introduce back in 1994. Churchill offer new customers with 8+ years of no claims bonus up to 80% discount on a new policy. If taking out a comprehensive policy, a courtesy car is included as standard. There is a 24/7 helpline and currently Chruchill are offering free breakdown assiatant provided by Greenflag with new policies. Churchill also offer an uninsured driver promise, meaning if you are hit by an uninsured driver you will not lose your no claims bonus and also not have to pay an excess on any claim! Names drivers on the policy can also earn their own no claims bonus and if your vehicle is under 12 months old they have a new-for-old policy.